This is mainly a summary page which serves as a map to Chronic Fatigue Syndrome articles on this website. The following thoughts are those which appear on this page. To read them, please scroll down past the list of articles. It takes strength to live with illness. Well done. My significant recovery from Myalgic Encephalomyelitis /CFS - what were the factors? Spirituality in Illness- How can it help? CFS/ME can be life-threatening. Even in its milder forms, it is a serious and debilitating condition. With a couple of exceptions, the beauty of much of the advice outlined in the CFS articles linked to from this page is that the advice is useful to LIFE in general. If the only motivation for an approach or a treatment is the hope of recovery, then we quite rightly stop if we see no improvement in health. With the approaches on the following pages, many - such as inner journeys and Qigong energy healing - offer immediate rewards in terms of creativity or greater peace of mind. With others, such as learning to rest, it is easy to see that this is a skill worth acquiring in times of illness or health. Persevere. Whatever your level of health you are learning and growing. Growth is a reward in itself. Can we live life in the present moment? If your life is lived with the aim of getting better, this is admirable. But if you seek recovery full-time your life is also in a way centred on being ill. There is a risk that you will live only for the future - a time of health. And sometimes you doubt this time will even come. It is a positive step if, as much as possible, we can also live our life around what we can do now. It is truly wonderful if we can take a step towards accepting ourselves and our life in this moment. Spiritual acceptance is especially powerful. When you feel ill, it is easy to feel bad about yourself or to be hard on yourself. 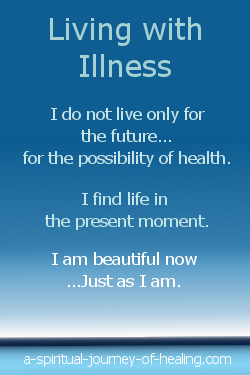 The language of illness is itself the language of judgment-"What is wrong with me?" It is important to nurture your self worth by bringing your focus to the many skills you are acquiring and the strengths you are developing in your journey with mild or severe Chronic Fatigue Syndrome. You may be exploring your psychology. You may be exploring your spirituality. You may be learning to rest. You may be learning to find a balance between rest and activity. You may be learning to find beauty in the quieter moments of life. Please stop and congratulate yourself for all you do. Even if it feels like you are not managing your health very well, stop and give yourself credit for what you are doing. You don't want to be ill. And it is wonderful that you are making the best of a difficult situation. If you feel in need of encouragement, you may enjoy my poem The Tortoise And The Hare. You may not always see it, but you are learning and growing. You are moving forwards. Some of you may be concerned that because I made a significant recovery through faith and processes that involve working with the mind, I was not physically ill, or do not take Chronic Fatigue Syndrome seriously as a physical illness. If so, please click here for additional pages, starting with a page on my experience of how CFS/ME can be life-threatening.